Global designer Marc Newson reflects his award-winning style in bathroom luxury. 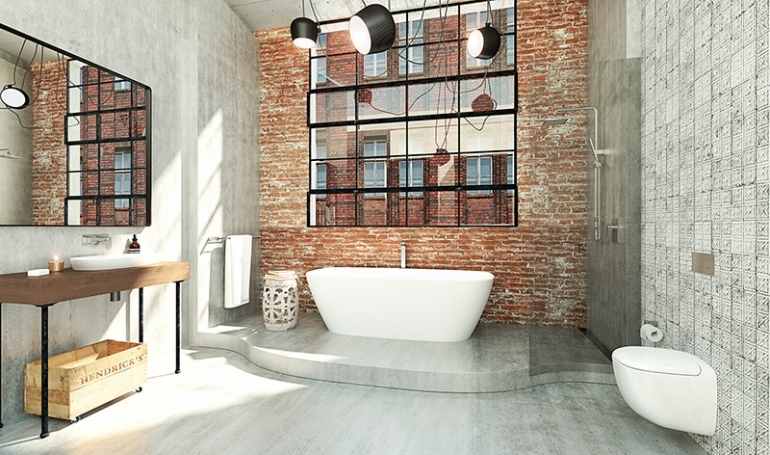 The Contura Freestanding Bath creates a striking focal point in any bathroom. Crafted from solid surface, this bath exudes warmth and is soft to the touch making it ideal for an indulgent and relaxing soak. Generous dimension and dual reclined ends make it the ideal bath for two. Combine with Caroma Contura basins for a beautiful timeless bathroom. 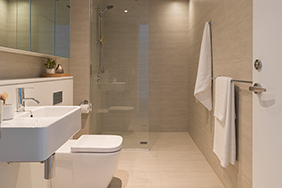 Track mixers and showers from Australia's leading bathroom brand will lift the feel of any bathroom. Choose the clean, contemporary European design without the European price. Contura Freeform ceramic inset basin is designed for beauty with a timeless life. 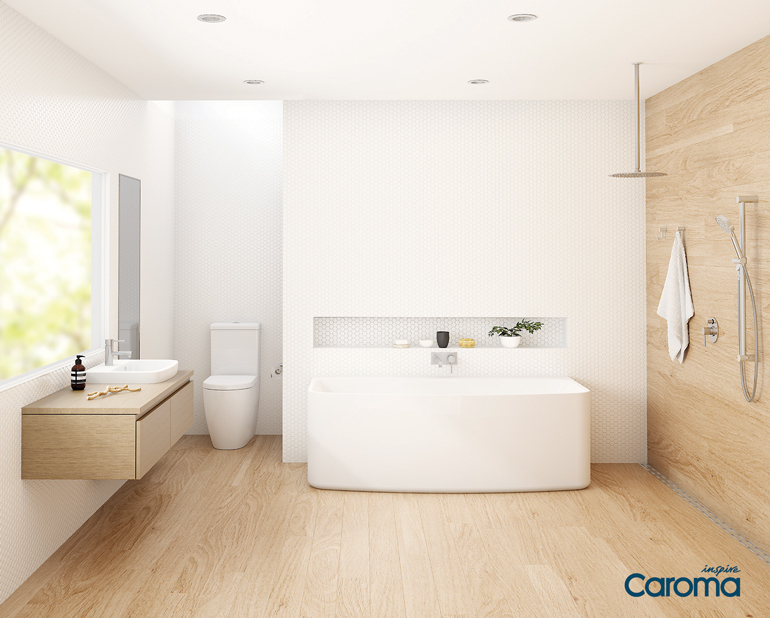 Combine with the Caroma Contura bath to make a real statement in your bathroom space. Featuring bold, designer styling and European inspired design, the Track range will lift the feel of any bathroom. 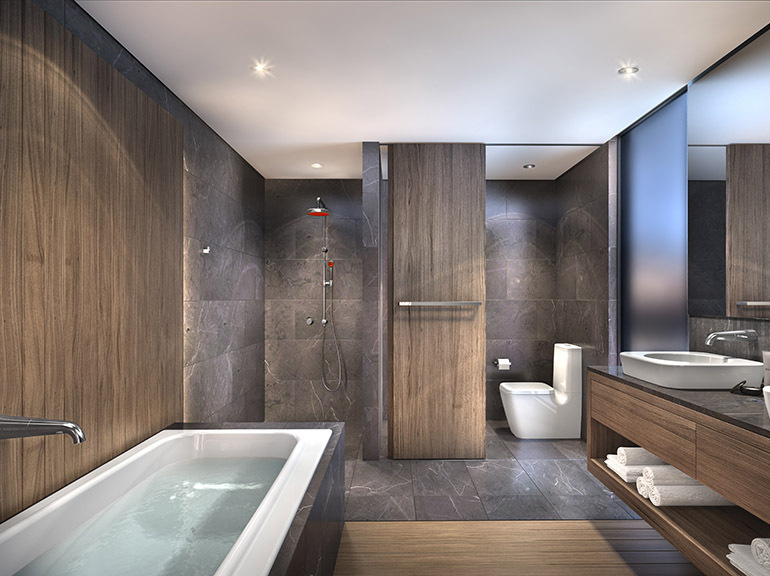 New Track mixers and showers from Australia's leading bathroom brand will lift the feel of any bathroom. Elegantly designed, Contura toilet suites are meticulously detailed throughout. Inspired by European trends and designed to suit an Australian sense of style, Contura toilet suites deliver ageless beauty. Featuring an organic curved, soft-close lid creates a sleek, integrated look. Strikingly sculptural and curvaceous, Contura is the embodiment of organic beauty. The minimal aesthetic of the Marc Newson Collection works perfectly with the warmer tones and natural elements. 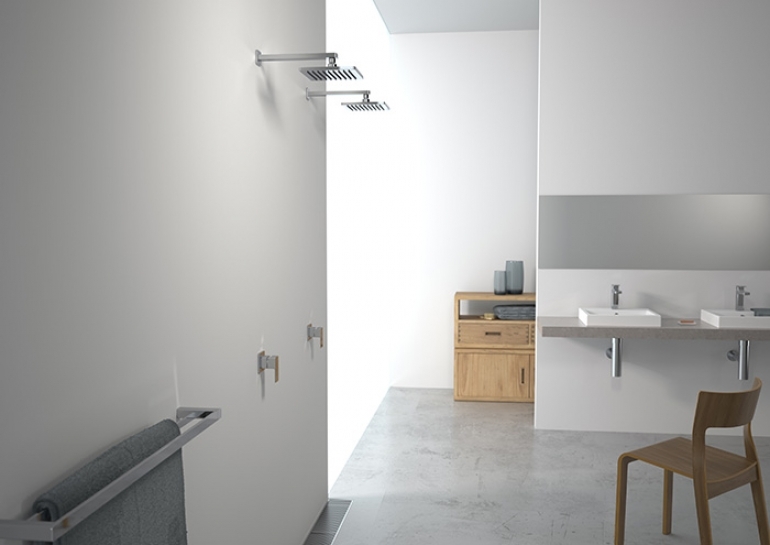 Caroma's Titan Shower Range balances contemporary style with unrivalled performance. 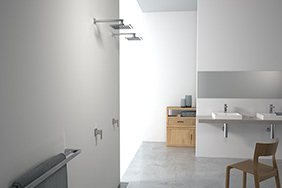 The range provides a choice of shower configurations to match your preferred shower experience and suit a variety of bathroom styles. Matching stainless steel mixers and accessories available in the Titan collection complement these shower pieces to seamlessly provide a unified style in the bathroom. Setting a new benchmark in tapware innovation, Caroma's first stainless steel tapware collection, the Titan range, offers premium quality and durability without compromising on design. With its complimentary accessories and superior resistance to wear, the Titan range is a must have addition to both your bathroom and kitchen. Create Modern luxury with neutral tones, soft curves and premium styling. 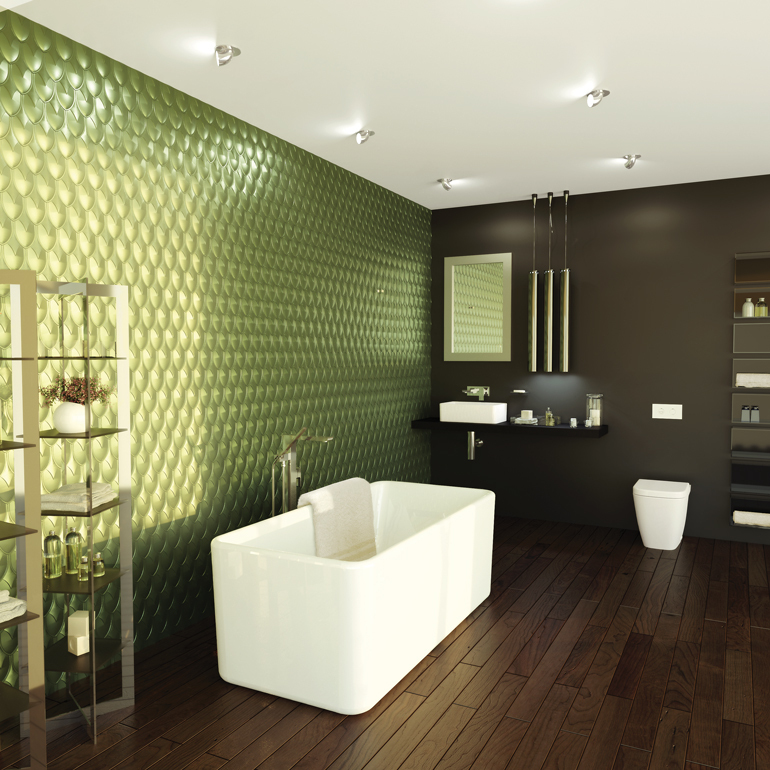 The Caroma Eco Bottle Trap adds unexpected style and colour to a functional bathroom piece. 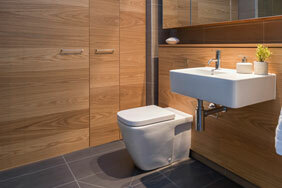 The Eco Bottle Trap complements a range of wall hung basins with a designer look and feel. Stunning and sophisticated in design, the matte black finish of the Liano Nexus mixers and bathroom accessories make a bold statement in any bathroom. Following the latest interior design trends, the distinct black finish enhances the look of your bathroom, offering a contemporary appearance that complements the complete Liano collection. An elegant bathroom collection with a timeless look. Enjoy a long, luxurious soak? You'll love Blanc, with it's tapered design to maximise your enjoyment of this beautiful, elegant bath. Light and classic, the calming shape of Blanc, in serene white, will relax both body and soul. Sleek, artistic and functional. Jovian's intense lines and distinctly European looking design will transform your bathroom or kitchen into the creative space you want it to be. Clever engineering ensures premium performance without compromising on aesthetic beauty. Our Jovian Collection is perfect for any modern home where style is celebrated. Resort style luxury in your own home. 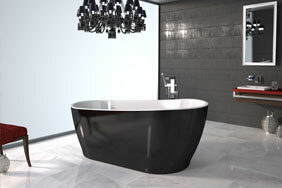 Noir freestanding bath has a distinct two tone colouring and seamless look. With a spectacular organic shape, subtle high back and tapered design, it is bound to be the center of attention in anyone's bathroom. Make your bath the centre of attention. 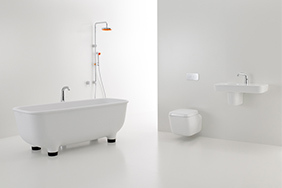 With the perfect balance of performance and appearance the Invisi Series II® wall faced range sit flush to the floor for an integrated streamlined look, smooth sides and sleek lines make care and cleaning easier. 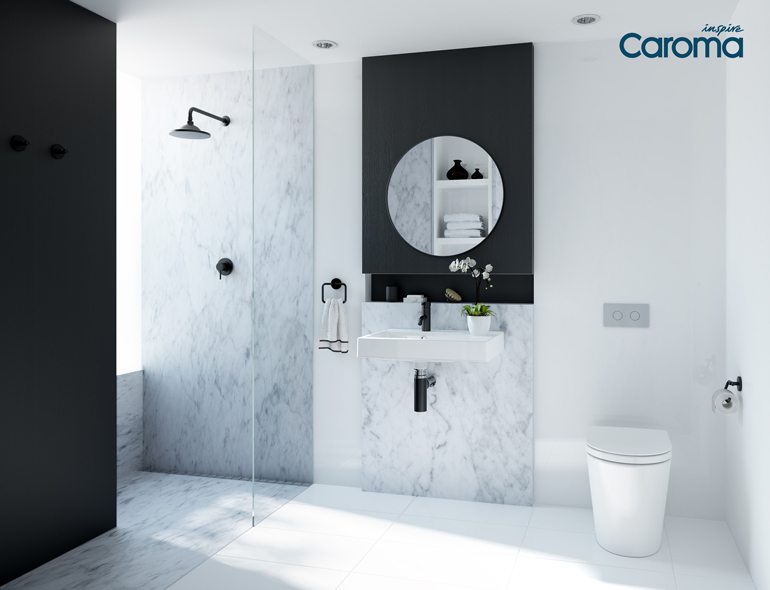 Contrasting defined lines with flowing curves, the new Cube Extension basin from Caroma features a built in integral shelf either on the left or right hand side eliminating the need for a vanity unit, making it ideal for the true minimalist! Proudly Australian designed, the premium Liano mixer range is guaranteed to meet the latest interior design trends. Square inspired outlets and platemount designs offer a distinctive, high quality look. The lever operation means easy and effortless water control while the ceramic disc core eliminates drips and minimises maintenance. The Modina bottle trap is a high quality, stylish chrome plated trap waste that can be used with a range of Caroma wall hung basins. Put a modern designer twist on your powder room. The Opal 720 wall basin design offers smooth rounded contours and clean lines. Available with optional shroud, this basin is suitable for domestic and commercial. Can be installed to comply to AS1428.1 - 2009 Amd1 Design for Access and Mobility requirements. 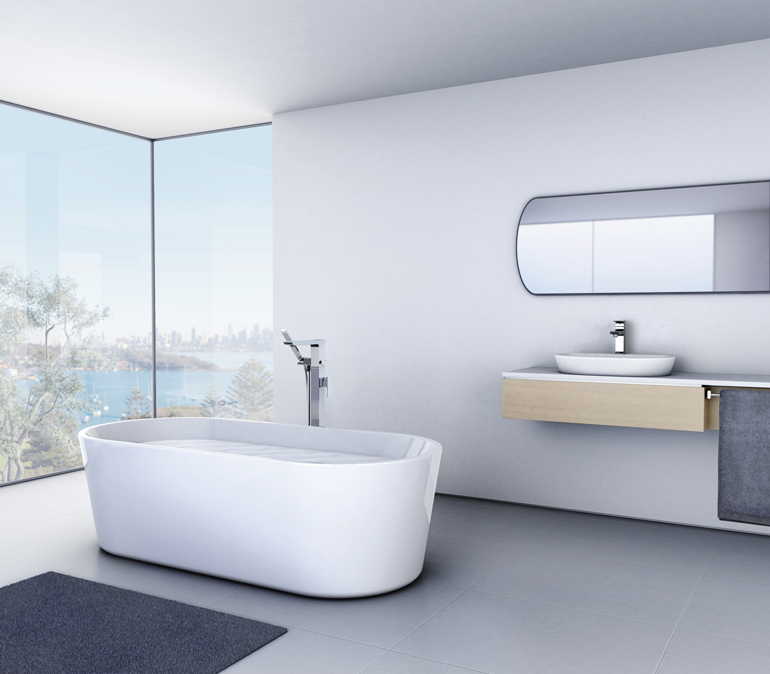 The new generation Opal II range brings polish and streamlined style to Australian bathrooms. With smooth, easy clean lines, wall-faced design and quiet, soft closing seat, the Opal II is a beautiful and practical addition to the Caroma range. A stylish bathroom sanctuary for everyone to enjoy. 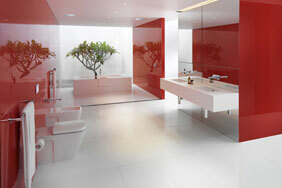 The new collection of Invisi Series II® toilet suites offer a comprehensive range of styles to suit all bathrooms. The stunning wall hung range of Invisi Series II® suites offer maximum space saving combined with the latest European inspired styling. Ideal for apartment living. 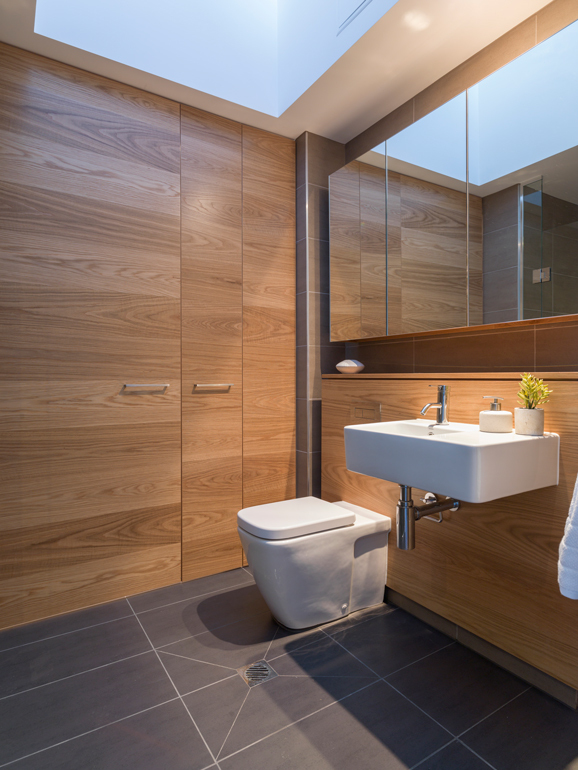 Make your bathroom feel bigger by using reflect surfaces. Guaranteed to meet the latest in interior design trends, the complete range of Liano accessories is fit for any style of bathroom. - In line with the Liano tradition, the design philosophy is both clean and uncomplicated. With these simple clean lines and minimalist feel the Liano range of accessories will add timeless sophistication to you bathroom. Guaranteed to meet the latest in interior design trends, the complete range of Liano accessories is fit for any style of bathroom. In line with the Liano tradition, the design philosophy is both clean and uncomplicated. With these simple clean lines and minimalist feel the Liano range of accessories will add timeless sophistication to you bathroom. 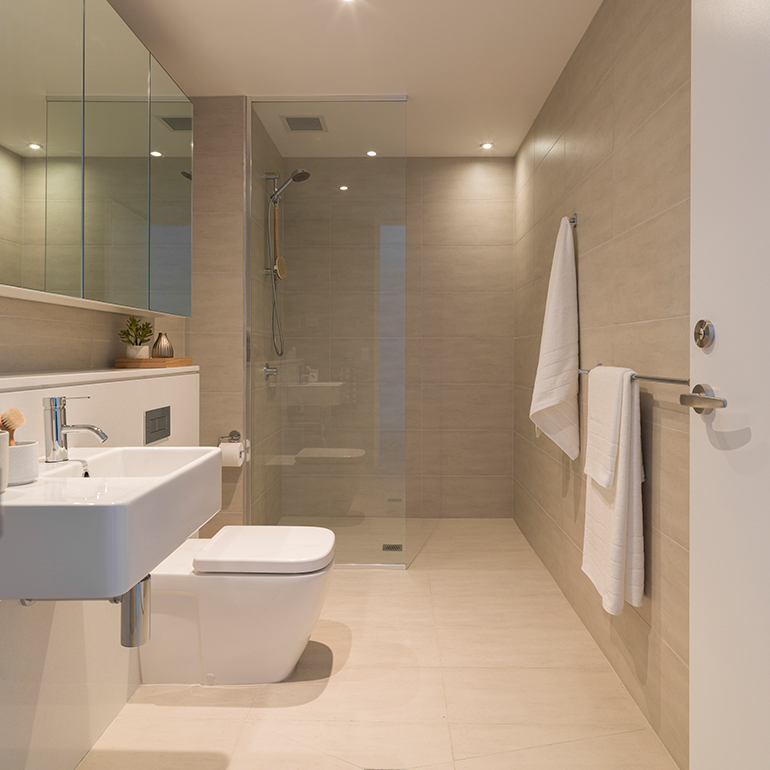 Create a bathroom with naturally soothing ambiance. A freestanding bath is a statement of sheer style and the dramatic Cube Freestanding Bath represents the ultimate in indulgence. 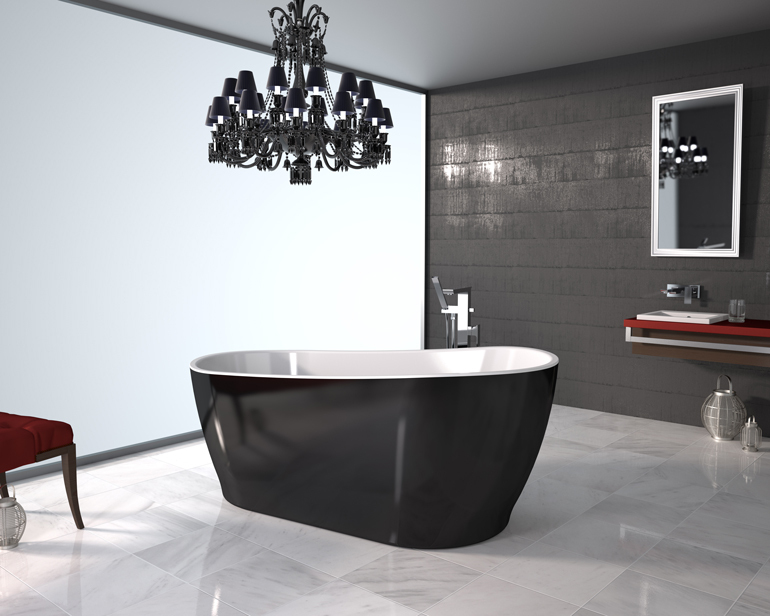 The thinner rim profiles enhances the crisp confident lines of this elegant and very contemporary bath. Creative design isn't always about thinking outside the square. 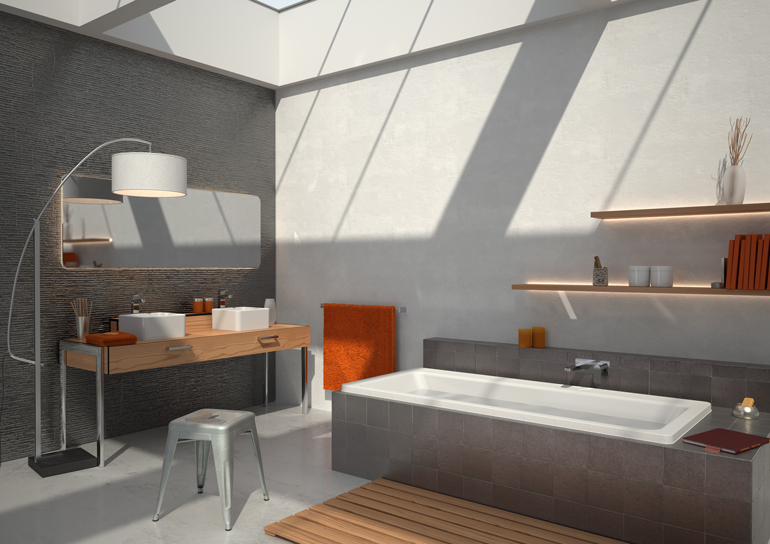 With strong square angles, slim walls and softened edges, Cube is a striking design option for the modern bathroom. The Cube 500 above counter is a generous size basin with a welcoming feel ideal for creating a stunning bathroom centerpiece. Think outside the box with a splash of colour, complimented by simple designs. 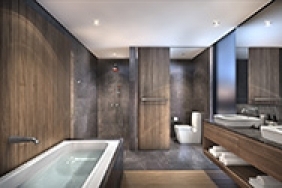 Nothing says luxury like a freestanding bath. This beautiful oval design will make your bath experience just that much more special. A seamless design with minimalist styling, complete with an offset waste for a comfortable bathing experience. Available in two sizes, including a compact size for smaller bathrooms. Simply breathtaking, a luxury statement in your home. Creative design isn't always about thinking outside the square. 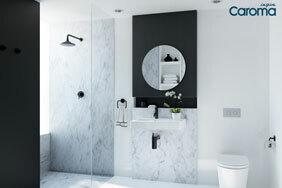 By contrasting defined lines with flowing curves, Cube strikes a dramatically inviting bathroom feature. The under counter styling reduces splashing, is easy to keep clean and puts the focus back on your bench top. Dare to be dark! Create a bathroom that's a standout statement. Creative design isn't always about thinking outside the square. 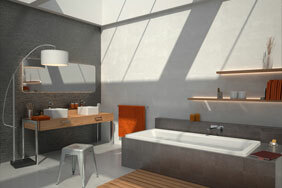 With strong square angles, slim walls and softened edges, Cube is a striking design option for the modern bathroom. The medium sized Cube 320 above counter basin is ideal for creating a stunning bathroom centrepiece. Ultimate relaxation for a loft style apartment. The Australian designed Cube range delivers the latest in European style. This premium bidette features an easy clean, wall faced style. 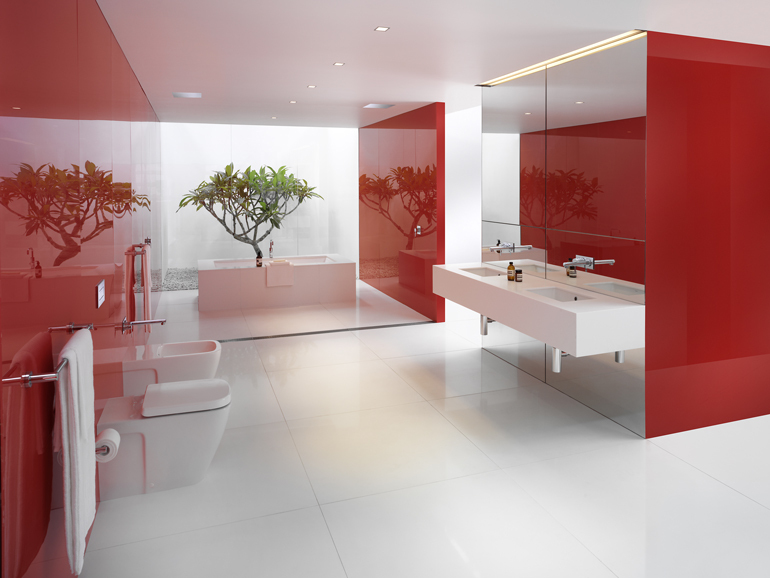 Bold bathroom design by award winning architect Ian Moore. The Liano above counter basin has been designed to meet the needs of the designer market for prestige projects. An architectural minimalist style was adopted for the square Liano incorporating a generous bowl area and a distinctive tapware platform. - The availability of a series of Liano basin design options allows for continuity in basin design throughout a project. Dorf's Epic range encapsulates modern design trends.